P.O.D. 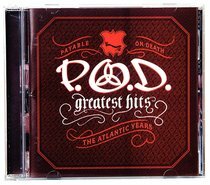 's GREATEST HITS: THE ATLANTIC YEARS is the first-ever compilation spanning their highly acclaimed break-out years on Atlantic Records (1999-2006). This 17-track album features one brand new track and one previously unreleased track, plus other signature tracks including "Southtown", "Rock The Party (Off The Hook)", "Alive", "Boom", "Will You", and "Youth Of The Nation". About "Greatest Hits: The Atlantic Years"